Algerian diplomats’ top priority issue is no other than Morocco and its Sahara. This is also the daily bread of many Algerian media which work under the guidelines of the Generals of the Algerian military intelligence Services (DRS). Algerian diplomats and media seem programmed just to make life difficult for their Moroccan neighbors, although official Algeria claims it is a mere observer and has no stake whatever in the Western Sahara conflict. 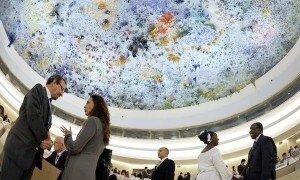 Reacting to this provocation, Morocco’s chargé d’affaires to the UN in Geneva, Hassane Boukili, described the Algerian diplomat’s statement as “biased, mindboggling and worthless” and recalled that Algeria, which stands as a defender of human rights in the Moroccan Sahara, flouts these very rights all year long on its own territory. Algeria is anything but an observer in the Sahara conflict. Algeria has been involved in the conflict since 1976 at the political, diplomatic and financial scales, said the Moroccan diplomat, arguing that Algerian diplomacy can by no means be credible when it comes to human rights whether in the Sahara or elsewhere because of Algeria’s own internal shortfalls in this area. As an evidence, Boukili mentioned the recent incidents of repression in Kabylia, the violence and discrimination cases in Ghardaya and the serious violations in the Tindouf camps that make the headlines of the national, regional and international media. Morocco has nothing to hide and leaves the doors wide-open to the UN, to human rights NGOs and to international observers that can freely conduct their tasks and investigations throughout the national territory including in Western Sahara. On the contrary, Algerian authorities have always refused to grant entry visas to these NGOs in order not to give an opportunity to local activists to denounce the abuses and violations committed on Algerian soil. Algerian diplomats’ allegations and slander are therefore pointless.